This has been the never ending summer and you know what, I’m TOTALLY ok with that! Keep the warm temperatures coming! But, here is where we are stuck between a rock and hard place….we want to wear all the fashion, but the 90 degree temps and humidity are holding us back. Am I right? 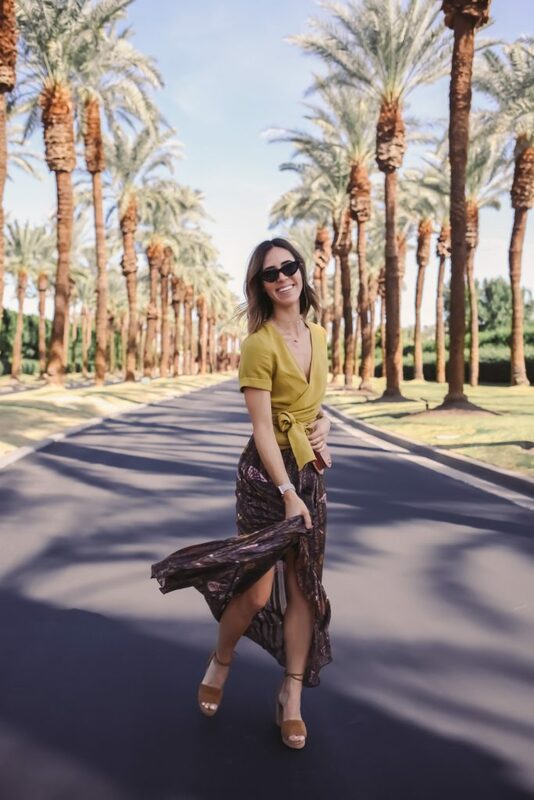 Today I’m sharing a super easy day to weekend look, with the help of Rent the Runway, on how to style fall fashion for warmer temps! J.O.A. Wrap Front Crop Top // My favorite element of fall fashion is all the jewel tone colors! This mustard wrapped crop top is the perfect balance of fall in hot temperatures – the linen fabric allows you to breathe and the mustard hue gives you that fall edge you need! BA&SH Skirt // Ok so BA&SH is a brand I discovered while in Paris last fall and it is chic AF! Who doesn’t want to recreate the effortless ease of Parisian chic! BA&SH have certainly captured Parisian chic in a brand and this skirt is no exception! This long wrap silk maxi skirt is the perfect fall accessory! Style it with his wrap front crop top or a chunky knit – perfect fall fashion for warmer temps! See by Chloe Convertible Bag // This bag has been one I’ve been coveting for some time now! This See by Chloe bag is not only adorable in size, but super on trend with this season’s craze for belt bags! The bag can easily transition from a cross body to a belt bag in seconds. If you are on the go and want to be hands free with your bag this bag is perfect for you! Valentino Cork Heels // I love a good 70’s moment and these Valentino cork heels are giving me life! They were a steal I found on The Real Real. Valentino is one of those brands that I’d highly recommend investing in – their shoes are super comfortable! See how I styled the heels in Marrakech earlier this year here! 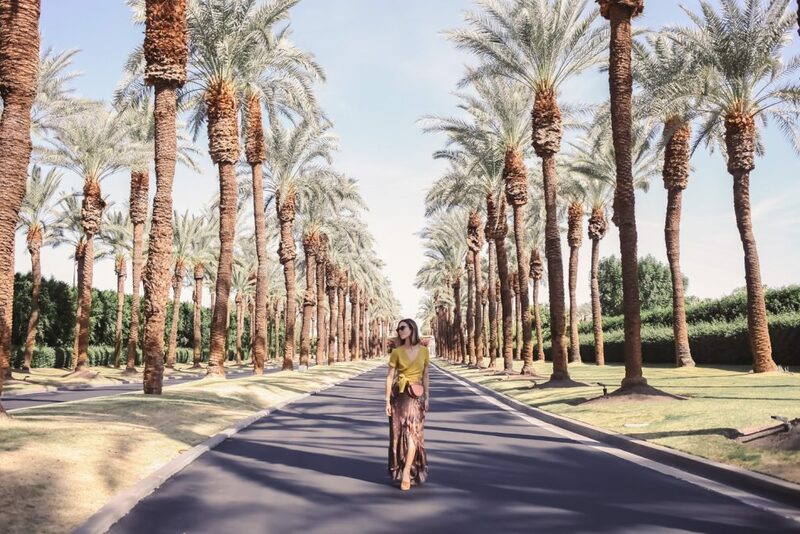 Right before my Palm Springs trip, I signed up for the Rent the Runway Unlimited subscription service – its a service that allows for unlimited access to over 500 designers and over 600,000 styles on the Rent the Runway website! You’re taking tops, skirts, pants, outerwear, handbags, cocktail and evening styles, from designers like Derek Lam, Rag & Bone and Gucci. I mean, need I say more? Once you are a member you can keep your items for as long as you want and swap them out whenever you are ready for something new. The subscription allows you to have four pieces at a time which can give you 1 – 4 looks! 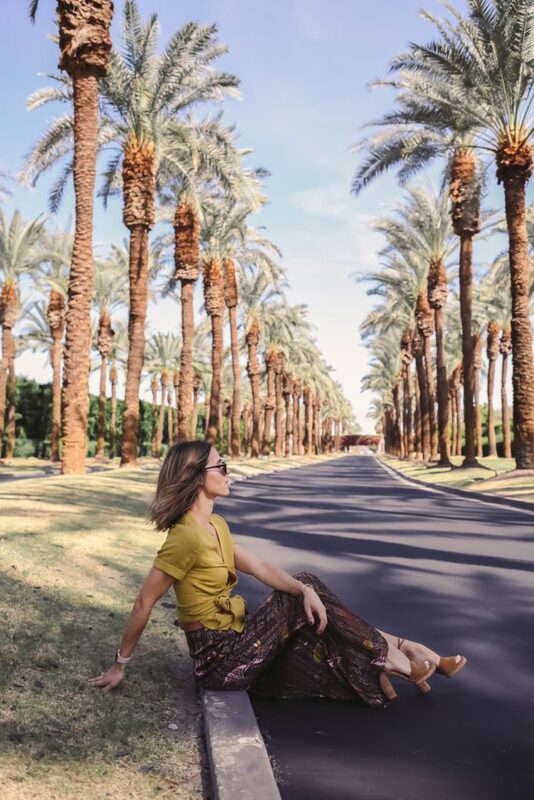 This top, skirt and bag are all from Rent the Runway and really helped me create this fall look in the middle of the Palm Springs heat! To learn more or sign-up, click here. This post is in partnership with Rent the Runway – all thoughts are my own.